In 1928 readers of the New York Daily News were shocked by this cover. It was the first photograph ever taken of an electrocution. The executed is a woman named Ruth Snyder, convicted of murdering her husband. The photographer was a journalist named Tom Howard. Cameras were not allowed in the execution room, but Howard snuck a device in under his pant leg. Prison officials weren’t happy, but the paper was overjoyed. It is one thing to know that executions are happening and another to see it, if mediated, with one’s own eyes. Pictures can powerfully alter the dynamics of political debates. Lennart Nilsson‘s famous series of photographs of fetuses, for example, humanized and romanticized the unborn. They also erased pregnant women, making it easier to think of the fetus as an independent entity. A life, even. 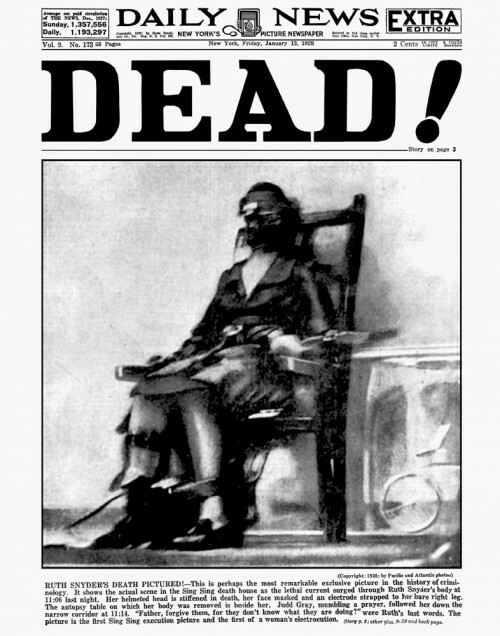 Unfortunately, Campbell’s article doesn’t delve any further into the effect of this photograph on death penalty debates. To this day, however, no prisons allow photography during executions. What if things were different? How might the careful documentation of this process — with all our technology for capturing and sharing images — change the debate today? And whose interests are most protected by keeping executions invisible? Executions used to be completely public events. They basically turned into fairs, complete with people selling food and souvenirs (and occasionally disrupting the proceedings) and people throwing things at those to be executed (or jumping up to drag their bodies off the dock to keep them from being used for anatomical or surgical study). They became private and contained in large part out of a desire to contain that kind of thing. So at least one possibility is that we'd be much worse off for it, and watching today's convict getting killed would become a social events. Centuries of public hangings, beheadings, drawing and quarterings, burnings at the stake, breakings of bones at the wheel, and so on, say it doesn't make an ounce of difference if the execution is a private electrocution or if they're eviscerating the condemned and burning their entrails in front of them before hanging.